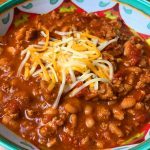 This recipe for white bean and turkey chili is one of the easiest chili recipes for your Instant Pot. With a pound of fresh ground turkey and a few canned ingredients, we can put together a great meal in a short amount of time. It’s a chili recipe with a creamy, smooth texture with lots of flavor. I wanted a chili recipe that was not a complicated 5-alarm chili, and that could come together with ease. Ground turkey and white beans compliment each other so well in this recipe. White beans – also known as Great Northern Beans are described as having a delicate, nutty flavor. We’ll then a southwestern style can of diced tomatoes with green chilies. Ro-Tel is a popular brand but there’s many store-brand versions as well. Then a small can of tomato sauce, some chili powder, onion powder, garlic powder, and some seasoned salt and we’re on our way to a great pot of chili. Finally, this white bean turkey chili is SO delicious when served with some shredded cheese. I love a Mexican blend consisting of monterey jack, cheddar, queso quesadilla & asadero cheeses. This blend is very common on grocery store shelves. It’s a very melty, smooth blend that again, compliments the rest of the chili ingredients perfectly. Mexican blend shredded cheese for topping. Spray a little non-stick cooking spray into the bottom of the Instant Pot and press the saute button. When it’s hot, add ground turkey and Lawry’s seasoned salt and brown for about 5 minutes. Press cancel when done. Add the chicken broth, chili powder, onion powder, cayenne and pepper. Mix well. Add the diced tomatoes and drained can of beans and very gently stir in. Secure the lid, make sure the vent is set to sealing and press chili button set for 40 minutes. When cycle is done let naturally release for 15 minutes. Chili will naturally thicken when cooling, but you can always use the saute setting for 5-10 minutes if you need it to thicken up a bit.